Sorry, but this is actually the one major problem I'm having with this game. 1. Me not having worked with stuff like this in java. I actually did made a game that had music a while back, but that was using external libraries, which I really didn't want. Now javafx seems to have a way to play sounds, but when I tried working with it that was rather annoying, because of a lot of obscure errors. I probably would be able to figure out how it works, giving it a bit more time, but then there is the second point. 2. I have the musical talent of a potato. Even though it's a bit of a I never even seriously tried thing. I did try to see if I could make something using LMMS, but everything I did was just arranging piano nodes in different patterns, and ending up with something that might not make your ears bleed, but nothing beyond that point. 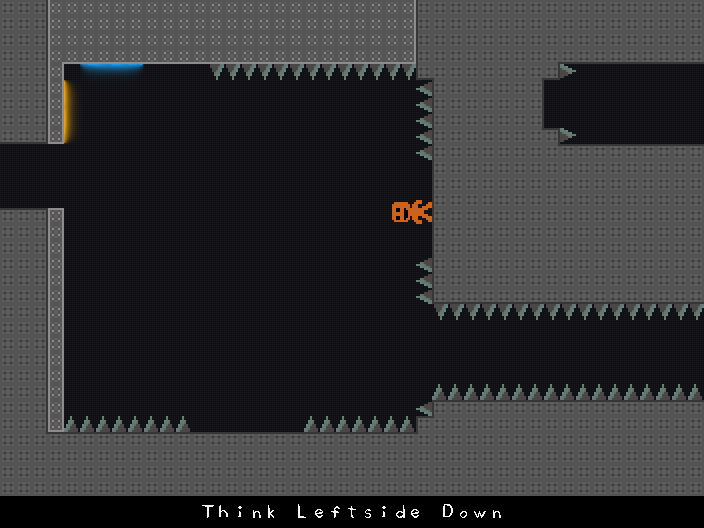 I don't know how to even do something in the style of VVVVVV, not even speaking of making something sound good. Also playing instruments (when I had to in School), was in the end just muscle memory for me. I would like to actually make some music for the game, if I were able, but ↑. So as it looks right now, if you are going to play the game, you will probably need to find yourself some music to turn on in the background. Sorry for shattering any hope and drifting off pretty far. 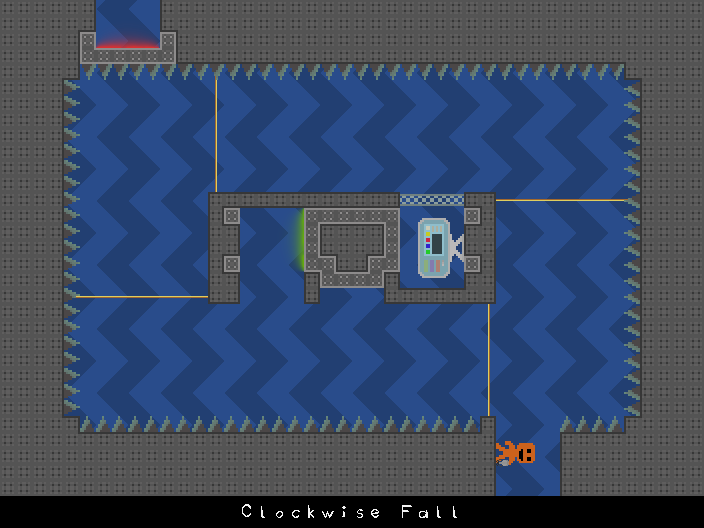 I'm pretty much done with the map, and am now working on the remaining minigames. As of now I think that I should be able to complete the game in about a month. I'll probably take about another month, for stuff like playtesting (to make sure there aren't any major embarrassing errors when I release it), setting up a website (Yes, I want my own website and not just use the first potential site, that allows me to upload files) and maybe adding some minor features. But I think a Release at some point during September should be relatively realistic estimation. PS: Sorry, for this being a double post. Geometry Dash is definitely harder than Osu! I played the level about a week ago, but somehow didn't reply so far. and also that it was easy to go back and play any section again. I missed one of the trinkets in the warp section, when playing it for the first time. What the h*** happened here? That was only one user. It's just a normal .vvvvvv File but with the ending .xml instead. The Content of the file is exactly the same, just change its ending, worked for me. Otherwise, no Idea why someone would upload a level in that form. 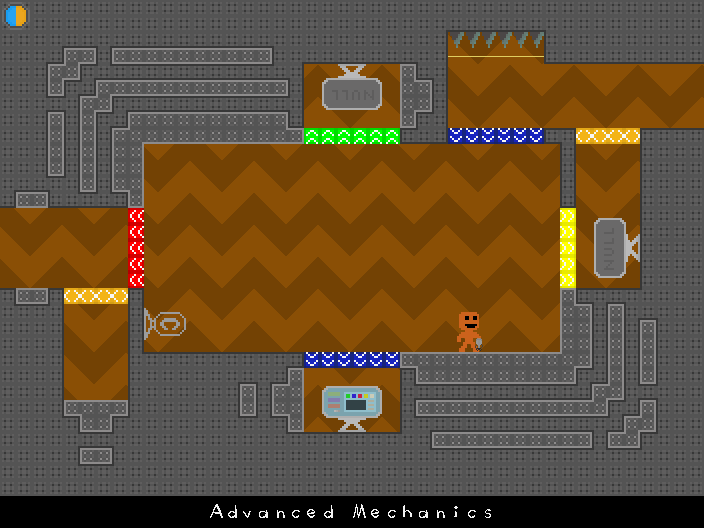 Speaking of the level, I played the start of it, but found that it was really annoying how the edges of rooms don't really fit to each other, and then there was this room which got horribly out of sync. r you, and mrytp and I voting against you. Who's the fourth person? Ok, so I'm going to write a comment here then. Basically I've been reading most of the comments here, but didn't really think it was worth commenting on. So, I think both levels weren't that impressive. I'm not going to write stuff that has already been said here again. Pattoo had somewhat of an ending instead of just a room with a Crewmate at the end. 5tr4 had the "And I'm going to eat you"-Joke at the end. It's interesting to see that VVVVVV also was the bug with falling into a 3 Block Gap, but I don't think that's good gameplay. So I voted for Pattoo on the Poll. Now everything makes even less sense.
. . . apparently the Poll just changed while I've been writing this, I actually voted the day 5tr4 submitted his level. As of me being not that good at the game, I have to say, that I like, that this level starts reasonably hard, at least from what I have seen so far. I'm not sure how far I will actually get in this level. Ok, so I played this level. 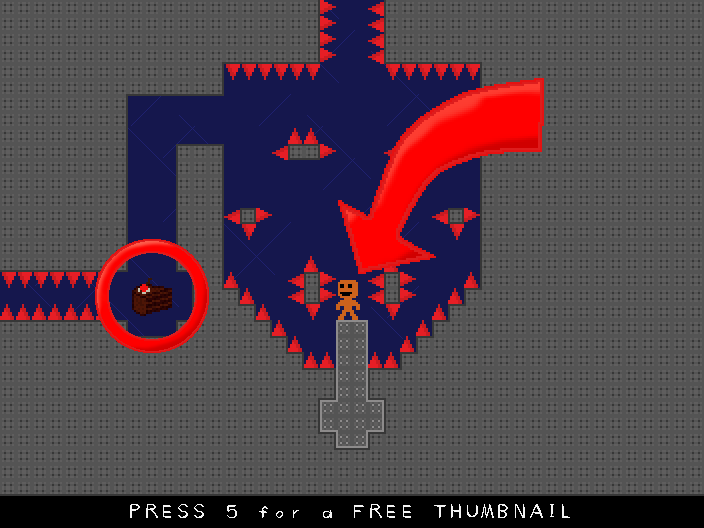 While playing I wasn't really sure if this level was supposed to just show off different designs while having only very simple to no gameplay, or containing simple to medium gameplay with no special design. So just focusing on the design, your level did have some neat visuals. I liked the optical illusion thing, where straight lines looked like they were curved (Sorry I don't know what Tileset this, off of my head). Otherwise there were some rooms with good combinations of different colors. The Cold/Warm-etc.-Section had in my opinion both, a good design and good gameplay. Then again there were a lot of rooms which had neither impressive gameplay nor design, which just felt like filler rooms to make the entire thing a bit longer. I guess you do get extra points for including Pluto into the Planet-Section, although we do have Images of Pluto, you now these with the giant heart shape. I liked how this level relied mostly on dialogue. So I played the level. What I liked was the green section where the rooms where all slightly different from each other. Although I think the changes in the later rooms of these could be a bit smaller and a bit more incremental. What I did not like was that the level was mostly single hard obstacles with a checkpoint right afterwards, this doesn't really require skill to do it but just trying it a few times until you randomly got it, like the ╦╦╦ Room with the 3 Trinkets these aren't unique challenges, but just doing the same flip thrice. The guessing parts seemed pretty annoying. Maybe name the first Room something like "Remember: Up Up Down Down ...". Sorry, if you did something like this but I didn't notice it. 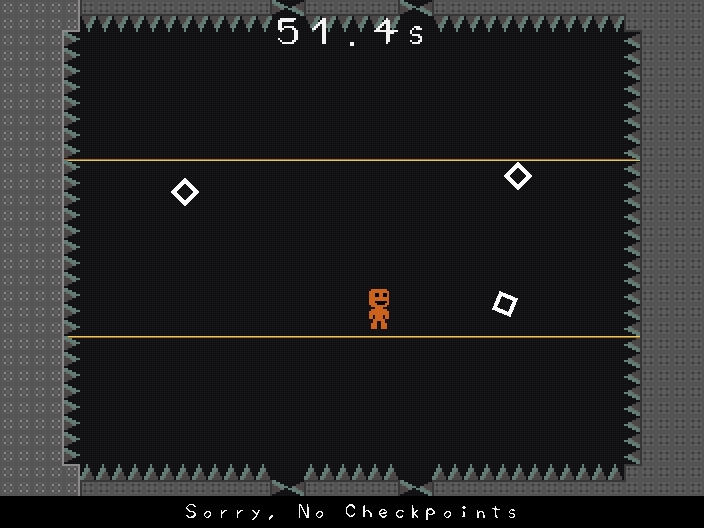 Also regarding the Pacman Room why would you make an enemy go through a checkpoint? First off, Thanks for all the positive comments. My bet is the player is orange because Chell wears an orange thingyidfk in Portal. More because of orange and blue being very typical colors for Portal. 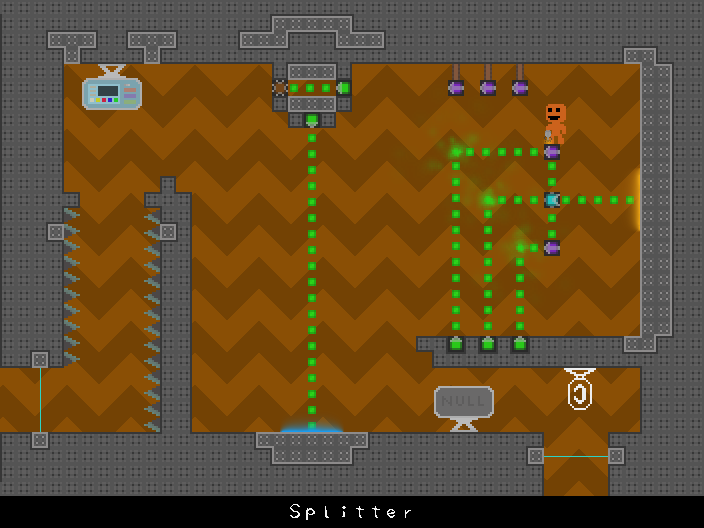 I tried working on a VVVVVV fangame a couple years ago but wasn't determined enough to finish it. I also had this problem with a few games I tried making before this. With VVOVOV I made good progress when I was starting with the game, at some point I switched over to making the Menu, may or may not have spent way too much time on the customizable Keybindings, until I eventually got the point where I spent too much time on it to just scrap the project, I definitly also had some phases where I wasn't motivated enough to work on this.